CVN 78 is the lead ship of the new Gerald R. Ford-class of aircraft carrier, the first new class in more than 40 years, and will begin the phased replacement of Nimitz-class carriers when the ship is commissioned. The Ford-class incorporates advances in technology such as a new reactor plant, propulsion system, electric plant, Electromagnetic Aircraft Launch System (EMALS), Advanced Arresting Gear (AAG), machinery control, Dual Band Radar and integrated warfare systems. Compared to Nimitz-class carriers, the Ford-class carriers have more than 23 new or modified systems. 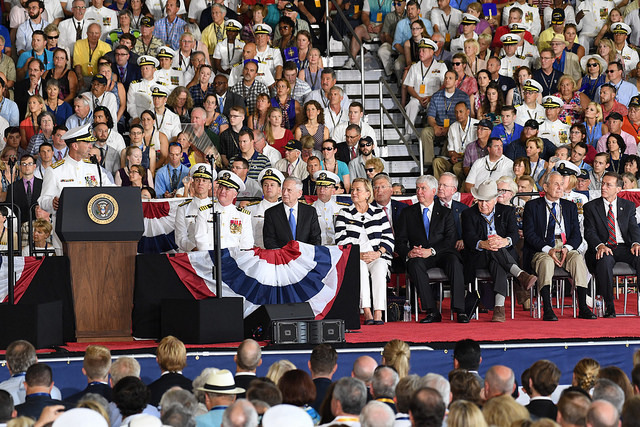 USS Gerald R. Ford honors the 38th president of the United States and pays tribute to his lifetime of service in the Navy, in the U.S. government and to the nation. During World War II, Ford attained the rank of lieutenant commander in the Navy, serving on the light carrier USS Monterey (CVL 26). Released from active duty in February 1946, Ford remained in the Naval Reserve until 1963. Ford was elected to the U.S. House of Representatives in 1948, where he served until President Richard Nixon tapped him to become Vice President in 1973. Ford became President in the aftermath of the Watergate scandal and served in the country’s highest office from 1974-1977.